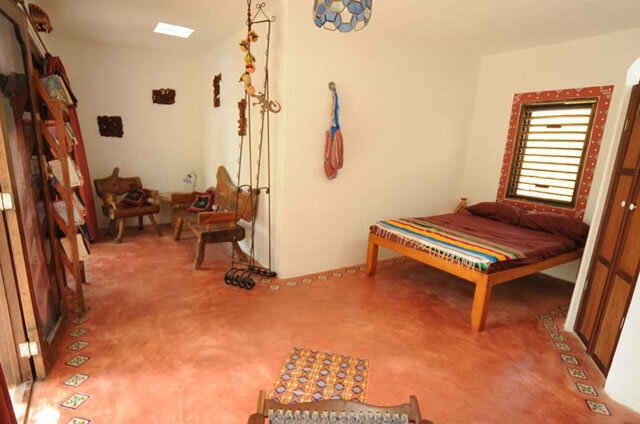 The Travel in’ Guest House is a separate, private residence located in our beautiful jungle gardens. 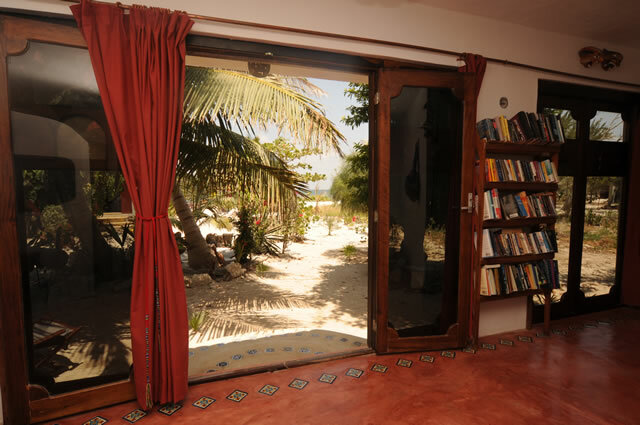 The Guest House features a private bathroom, shower and entrance, as well as large French door frontage with a great view of the Caribbean Sea. 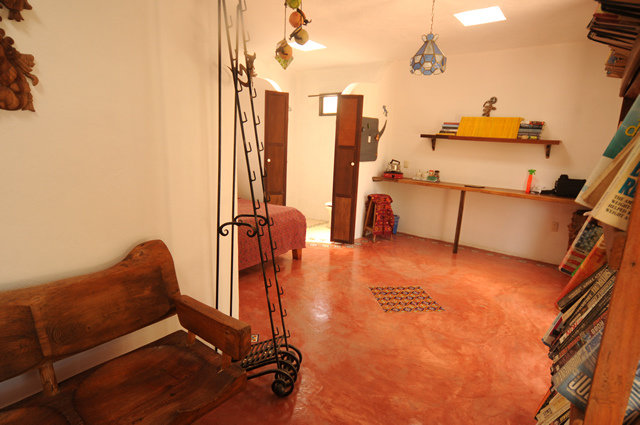 The Guest House has its own library, as well as seating for guests and lots of privacy. 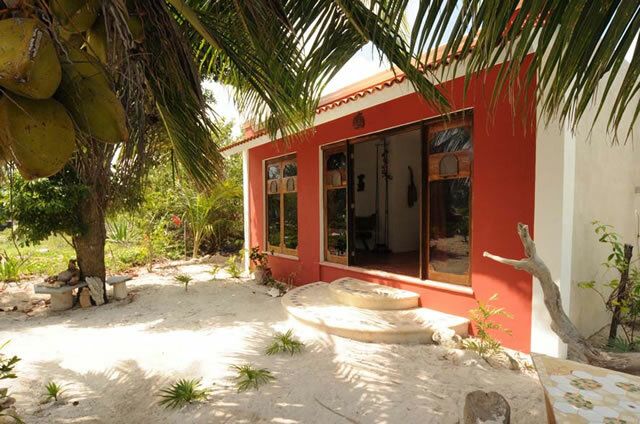 At 49 US per night, this is a real bargain for divers, snorkelers and anyone with a sense of adventure. Ask us about seasonal and other special pricing! There are various sitting areas in the garden and on the beach where you can relax, read a book or enjoy a drink while watching the moonrise. Stargazing is at its best in Mahahual, where the heavens are deep and black. The sounds of the jungle will accompany you to bed. We are proud to still have a wide variety of local wildlife visit us, including many migrating birds and lazy lizards. Straight in front you will find the world’s second largest coral reef, with excellent diving, snorkeling and fishing. You may use our kayak and snorkel equipment. Since this is a very natural area, we recommend that you bring insect repellent and suntan lotion. As this is one of the last untouched beaches on the Mexican-Caribbean, we would like to keep it that way. We do not clear the beach of turtle grass, a natural habitat for sea life and layer of protection for our sand. We power Travel ‘in with solar energy and catch rain water for bathroom uses. High energy-consuming appliances such as hairdryers can’t be used here, but you will have no problem charging your PC, camera or mobile phone during sunlight hours. There is no cooking in the room. 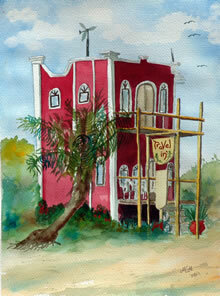 Wireless Internet is available in the restaurant.